TopProx Proximity cards are the fastest way to get your programmed proximity cards! We program all TopProx cards onsite, which allows us to ship your TopProx cards within 2 business days. 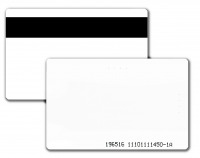 Our line of TopProx cards includes cards with and without a magnetic stripe. We also carry cards in PVC and composite PVC/PET construction. PVC cards can be personalized with your direct-to-card printer when composite cards are ideal for retransfer printers. Built to last, our line of TopProx cards will help you keep everyone safe and secure easily and affordably. We offer a full line of Proximity cards called TopProx. We program these cards onsite which allows us to ship your TopProx cards within 2 business days. Proximity cards are read-only devices that have an embedded antenna. The cardholder data can be read when the proximity card is passed within range of a reader. The range of operation for proximity cards varies typically from 2.5" to 20" (63.5 mm to 508 mm) depending on the reader. Mainly used for access control applications, proximity cards are also chosen in environments where crowd control is a factor. Proximity cards are available in ISO thickness cards from 0.027" to 0.033" (0.6858 mm to 0.8382 mm) and clamshell cards from 0.060" to 0.070" (1.524 mm to 1.778 mm). HID iCLASS® Prox cards combine HID 125 kHz Prox and iCLASS® 13.56 MHz read/write contactless smart card technology in a single card to provide powerful access control devices. HID Indala proximity cards use composite materials that are highly heat resistant, making them ideal for high wear-and-tear environments such as university or factory settings. WHAT ARE THE DIFFEERENT TYPES OF PROXIMITY CARDS? * ISO 7816 compliant for embedding optional contact smart chip module. Some custom graphics can increase overall card thickness. * ProxPass II features a one-year warranty and has a 2-5 year battery life, depending on usage. A format is the structure of the data stored in an access control credential. It is comprised of a set of binary digits – “bits”– put together a certain way to create a binary number, which is converted into a credential number by an access control system. The number of ones and zeros, and how they are put together, determines the format and ultimately the credential number. 1-11111111-0001011111101100-1 with the first set of ones (in red) representing the site code and the second set of ones and zeros (in blue) representing the credential number. The access control system sees this format as card number 6124 with a site code 255. The 26-bit format is the most common format requested and can be used by most access control systems available today. However, there are many formats available and some formats are unique to access control systems and do not work with other formats at the same time. This is why it is so important to know the format when ordering credentials. The 26-bit format (Format number H10301) is the industry standard format, and consists of 255 possible facility codes. Within each facility code, there are 65,535 unique card numbers. The 37-bit format can be used to program a wide range of unique credential numbers. Although it is available to all customers, not all access control systems can handle such a large data length format. In addition, many systems are unable to handle a format that does not have a facility code. This 37-bit format has 65,535 facility codes available and over 500,000 card numbers within each facility code. Just like the 37-bit format without facility code, many systems are not capable of handling a format as large as 37 bits. In addition, many systems are not capable of handling a facility code as large as 65,535. The Corporate 1000 format is a 35-bit format with a unique Company ID Code and more than 1,000,000 available credential numbers. The Corporate 1000 format offers the end-user a large quantity of available credential numbers and is typically reserved for customers with the need or potential to badge a large number of cardholders. The Corporate 1000 format is also available to large, geographically diverse organizations with a requirement to unify the structure of their access control system around an exclusive access control card format under their control.